I am delighted to welcome husband and wife team, Mark and Diane to my blog today! For those who don’t know already, could you tell us about yourselves and your book(s) please? 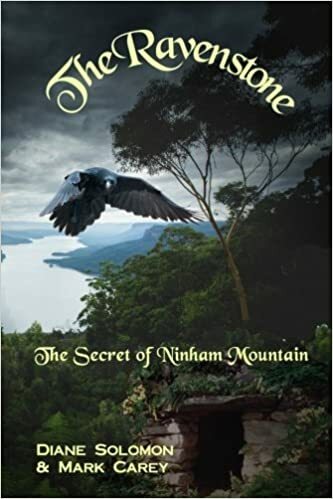 Diane & Mark: The Ravenstone: The Secret of Ninham Mountain, is a middle-grade fantasy/mystery, the first of a new series. Thirteen-year-old twins, Aidan and Nadia Shaw, discover a beautiful icon of black basalt stone carved with raven heads. This magical stone, the Ravenstone, can transport twins through time! Not wishing to spoil the story, all we can say is that an ancient shaman sends them on a mission to find something that will change their lives, and the lives of their family, and indeed, all mankind. If they can survive the incredible challenges and dangers that beset the path. They are aided by the power of the Ravenstone, by their friends, and by their own special gifts of high intuition and photographic memory. The story is full of mystery, adventure, valor, glory, with a sweet touch of redemption and heart. About us: Diane: I was fortunate to enjoy a highly successful singing career in the UK, with my own BBC TV variety show and many other TV appearances such as on Morecambe and Wise. Highlights of this wonderful time included a sold-out concert tour culminating at the Royal Festival Hall in London, and major concert tours with Kenny Rogers and Glen Campbell. Then the dreaded M.E., or Chronic Fatigue Syndrome, destroyed my entertainment career. I struggled for almost eight years, years of wading through half a life that felt like all descriptions I have ever read of hell. I finally regained my health with the help of a homeopathic remedy, which launched me into new studies and a second career: homeopath and nutritionist. But, I knew that the path of writer awaited, in the distance. Now it is here and I am loving it! My husband Mark Carey is a brilliant, funny, insightful man and I get to write with him! How cool is that? He is a retired biologist, naturalist, and accomplished voice-over artist. We live in New Hampshire, on many acres of woods and streams, where we design gardens and meadows, sing, write, and watch wildlife. We have a “green” home, with geothermal heating and cooling, and solar panels in the meadow and on the roof. We have no utility bills at all for about nine months of the year! Mark: Diane likes to say when a truly great idea comes along you channel it rather than take credit for it. I must say that is what happened a lot during the brainstorming and writing of The Ravenstone. Mark: There is a chicken or egg component to this answer. Even I am not sure if we decided to pattern Nadia after my daughter or simply noticed that they shared personality traits. Either way, once the connection was made, we absolutely wrote Nadia by asking, “What would Kathleen do?” Aidan was based much more loosely on me, me if I were a tween, to be more accurate. Mark: Hmmm. It isn’t a science, that’s for sure. More channeling, I think. I came up with the interplay of twins whose names are the reverses of each other Nadia and Aidan, but I cannot for the life of me explain how. Wine might have had something to do with it. Diane & Mark: For the pure logistics, we are outliners. We use a large board, into which we stick pushpins to hold up postcard-sized cards with scenes, sections, or individual pieces of the story (or sections if non-fiction). Then we can physically see the jigsaw puzzle and move things around until they feel right. Character is vital: We spend a long time on character development, and each day before either of us writes, at least at the beginning, we tend to read through all the notes and reacquaint ourselves with the character. Diane: Yes, if I am beginning to live and breathe the character – if I am in the protagonist’s head, and she is in mine – she will write her own actions and words. But, I want to bring up something else, something required for the writing process for me. It’s hard to define, but essential. My writing seems to stem from what my husband calls my “extreme heart.” My writing process only works well if heart is involved. By that I mean it has honor, integrity, caring for others, meaning, courage, and love in some form. I can’t write in fields of horror or terror, or genres that focus on shallow, meaningless violence. The protagonists, the main characters in fiction need to be real, to be human, with flaws, certainly, but with good hearts. The character arc of the main character must move toward kindness compassion, truth, honor. When working in non-fiction I lean towards self-help books or educational books that offer something of value to the reader. Ok, ok, yes, I am Pollyanna. And perhaps the most important note about the writing process, for me, is to leave my ego outside the door. Get out of my own way. Leave judgment until the editing process begins. Let the flow happen. That is also where the great fun is! Mark and I are very good at that with each other. We just want what is best for the book, and often either of us will say, “Oh, yes, let’s go with your idea, that’s much better.” We don’t fall out at all when writing together, for which I am completely grateful! Mark: A single favorite? No. I wouldn’t dream of placing one author on a pedestal above all others. I live in awe of so many writers that I view them more like a pantheon of gods, or stars in the sky. But a short list would have to include Jane Austin, Shakespeare, Dickens, Twain, Hemmingway, Oscar Wilde, Jack London. Yes… I am olde-school. Mark: I would love to meet Jack London. I would ask him to take me with him on his next trip to the Klondike. The biggest impact stories for me were 101 Dalmations, in the third grade and A Wrinkle In Time around the same time. Great stories, well told! They inspired me to float in my imagination and begin to try the “What if?” game. Asking “What if?” is often how my ideas arrive. Diane: I was about eight or nine years old when I realized that I could describe a place or tell a story in such a way that other people would enjoy reading it. I had written a short essay for school about walking into an empty church. The piece was only a page long, hand-written, but the mood, the description, the feeling of the piece seemed to write itself. My teacher was very complimentary and right then I knew I would be an author and writer as a full-time career one day. I have been writing ever since: songs, screenplays, ghost-writing fiction and non-fiction, solo books, and now writing with my husband, Mark. Diane: Oh my. The part of me that breaks easily would like to say Dr. Zhivago by Boris Pasternak. I long for a happy-ever-after ending, or “continuing,” I should say. But, if our protagonist does not die at the end, would it have the same soul-wrenching power? Would it portray as strongly, and shatteringly, the effects of war on love and our existence? Perhaps not. I shall not presume to imagine Mr. Pasternak’s work any other way. Diane & Mark: We have structured most of the second book in The Ravenstone series, to be called, The Book of the Stone.” We will write it over this winter, which makes the long snowy evenings in New Hampshire cozy and fun! Diane: My next project, which is more or less running parallel with the second Ravenstone adventure, is for women. Entitled, 88 Guys for Coffee, it falls somewhere between memoir and fiction, perhaps a little like Eat, Pray, Love. It tells the story of a 45-year-old woman, shockingly and painfully abandoned by her husband, and her humorous, self-searching path to recovery via five years of online dating. I am using my own personal experience in this rather bizarre realm (falling under the category of “you can’t make this stuff up!”) but have created an all-new woman character. Not me. Too painful! Too embarrassing! You will not believe some of the stories, but they are all true. And, I hope you will love Laura, whose big heart is broken, yet she keeps laughing, running, helping her patients with alternative medicine, and trying to figure out why she, and other human beings, do the things they do. Feel the things they feel. Mess up the way they mess up. Diane & Mark: The Ravenstone: The Book of the Stone is planned for mid-June 2017, so kids can read it during their summer break. 88 Guys for Coffee does not yet have a set publishing date… Its resolution is more amorphous! “You were born to this path! This quest is your fate.” Imagine a raven appearing out of thin air and guiding you to an exquisitely carved icon that glows with ancient light and pulses with shamanic power. This is how the adventure begins for Nadia and Aidan Shaw, thirteen-year-old twins, who live in idyllic Cold Spring, New York, on the banks of the Hudson River. Armed with the power of the Ravenstone and their own special gifts, they embark on a harrowing quest across centuries, at the bidding of a mysterious old shaman. They must depend on their courage, their faith in their friends, and luck. Or is it destiny? If they succeed, what they bring back could change the course of human existence. “Solomon and Carey’s imaginative storytelling sweeps you into a fascinating tale of mystery and adventure. Young twins Nadia and Aidan stumble upon an ancient power that could help their family in the future, or trap them in the past forever.” ~ Linda Zimmermann, successful author of 30 books about hauntings, the paranormal, and mysterious stone sites. ABOUT THE AUTHORS: Diane Solomon has had a wonderfully diverse career path that has included her own variety show on BBC TV in England during the late seventies, and major tours with Glen Campbell and Kenny Rogers. She is also a published author with a successful book entitled, Chronic Fatigue Syndrome: a guide to the homeopathic treatment of CFS/M.E. Co-author, Mark Carey, is a retired biologist, naturalist, and voiceover artist. Diane and Mark live in southern New Hampshire on 55 acres of woods and streams, where they write, create gardens, and watch wildlife.